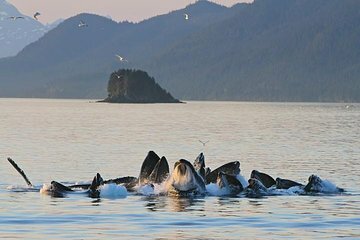 Passez 2 heures sur les eaux du port d’Ake Bay à la recherche de baleines à bosse lors de cette excursion en bateau depuis Juneau. Écoutez les commentaires de votre guide et surveillez les autres animaux marins tels que les orques, les pygargues à tête blanche et les lions de mer. Collations, rafraîchissements et transport aller-retour depuis le mont. Tramway Roberts à Juneau fourni. Fun ride on the boat hunting whales. We did see about 5 whales and a couple of tails. The ride over to the boat was interesting and we saw a couple of glaciers on that ride. This was a fabulous tour. We had a wonderful crew that truly made the excursion special. They were knowledgeable, friendly, and as excited to see the whales as we were. The captain, Jordon, knew exactly where to go so that we would have the best opportunity to see whales. Amber and Tory were truly interested in making sure that we had the best possible experience. The three of them were screaming as much as we were when the whale, Sasha, breached, not once but four times. Then they explained that it was very unusual to see them breach this early in the season. The excitement didn't stop there - the whale was truly putting on a show for all of us. Jordon found a total of 4 whales for us. We had such a great time, we highly recommend this tour and these guides. The experience was more than we ever expected. Olivia and Mark were great. Olivia was kind to my twin 2-year old sons and let them play with some of the toys they kept on the boat. 2 hours was plenty of time so don't worry about there not being enough time to actually see some whales. The whales are quick though. It gives new appreciation for those that capture them on camera. Olivia answered all our questions and we saw several whales. We even saw an Orca whale which is very uncommon we were advised. The others were the humpback whales. We especially enjoyed Olivia's story about her dad's bear attack and Mark performed his whale dance. Thanks!!! Wonderful tour!Captain Ed, Mark and Emma were absolutely wonderful, fun and informative, plus they not only found us lots of whales to watch, they also found us sea lions and bald eagles swooping around. I would recommend these guys to everyone!